At the meeting of the Indiana State Normal School Board, April 29, 1905: "President Parsons presented the matter of employing a Dean of Women. He spoke of the fact that a large proportion of the students of the State Normal School were women, and that it seemed desirable that some mature, competent woman should be appointed whose chief business should be to look after the health and interest so after the young women of the School. The position was created, and the President was instructed to find some suitable woman to recommend for the position." At the meeting of the Board, May 27, 1905: "the President again spoke of the matter of the Dean of Women for the institution beginning with the opening of the next school year. He said that, in his opinion, it was desirable to have a woman not under thirty years of age nor over forty, in order that she might have the solidity and maturity of judgment that comes with middle life and also that she might not be so far removed in age and experience from the young women as to make it difficult for her to see matters from the students' point of view. "In the second place, it would be desirable to secure a woman who possessed a large scholarship so that occasionally, if other duties permitted, she might teach a class for an hour when illness or other emergencies prevented the teacher from being present. "In the third place, as the Dean of Women would become virtually a part of the administration of the School and work under the immediate direction of the President, it would be desirable to have a woman had no pre-conceived theories or ideas as to the duties of the Dean. "The Board instructed President Parsons and the President of the Board to take such steps as might seem desirable to secure a competent woman for the important position." The President of the Board was unable to serve on the committee to find a person for the position of Dean of Women. Mr. Tomlin of the Committee on Teachers and Instruction acted in his place. At the meeting of the Board on June 30, 1905, the committee reported that it had had an interview with Miss Martina C. Erickson of Atlantic, Iowa, and felt that she would meet the requirements for the position. The Committee recommended that she be elected to the position at a salary of $1,200 for the academic year. This action was concurred by the Board. The Board formally confirmed the appointment of Miss Erickson on August 5, 1905. The Indiana State Normal School Catalog of 1905-06 includes the following statement concerning the duties of the Dean of Women: "The Dean of Women has general supervision of the women of the school. By virtue of her office the Dean gives special attention to the matter of health, manners, morals and general deportment of the women. It is hoped that the Dean may be of service to the women by counsel, advice and other forms of helpfulness along the lines of peculiar interest to them." "Parents may rest absolutely secure in the knowledge that the Dean keeps in close touch with every young woman in the school and is careful to see that only proper places under the best conditions, are selected as their homes." After one year in service, Dean Erickson's report to the Board showed many hundreds of calls were made upon students; attention was given to more than 100 sick women; and the personal inspection of more than 300 houses containing rooms offered to students was made. It seemed to be the general impression that the work of the Dean had fully justified the Board in creating this place on the faculty. June 20, 1910, President Parsons announced to the Board that Martina C. Erickson, Dean of Women, would retire August 31. He recommended Charlotte Schweitzer (Mrs. Burford) as her successor. Miss Schweitzer was elected August 6, 1910. In her tenure as Dean of Women, Miss Erickson instituted systematic supervision of housing for women. Girls lived in rooming houses, and all rooms were inspected and approved. She gave a great deal of attention to the "social graces". The Women's League, which was the forerunner of the present Panhellenic Council, was organized into clubs. These became the groups from which our present sororities were founded. Because Miss Erickson's forceful character and strong leadership, she had great influence on the young people of the School. There were three important faculty committees in those days dealing with student affairs: (1) Student health: (2) discipline: and (3) entertainment and social affairs. Dean Erickson served on all of these committees. Thus, more than fifty years ago, the foundations were laid for the program of student personnel services we have today. She was succeeded by Charlotte Schweitzer (Mrs. Burford) who served as Dean of Women 1910-1946. Miss Helen Reeve succeeded Mrs. Burford and served to 1956. In a period of 51 years, there were three Dean of Women. Dr. Florence Thompson succeeded Miss Reeve and still serves. Through the services of these four women, there has developed at Indiana State College a tradition of service to women students that has its root in the program initiated by Martina Erickson over 50 years ago. Martina Cecilia Erickson was born in Trondheim, Norway, October 25, 1870. She came to America with her parents and grew up in La Crosse, Wisconsin. She was graduated from Minnesota State Normal School at Winona in 1888. She also attended Chicago University. She began her teaching career in Rochester, Minnesota. From Rochester, she went to Kenosha, Wisconsin, then to Milwaukee-Downer Seminary for girls as head mistress. She was teaching at Atlantic, Iowa, at the time she was interviewed for the position of Dean of Women at Indiana State Normal School. In 1910, Miss Erickson was appointed principal of the Monticello Seminary for girls at Alton, Illinois and resigned her position as Dean of Women at Indiana State Normal School. As principal of Monticello, Miss Erickson achieved remarkable success. Prior to her assuming the position as Principal, Monticello had been as academy for girls of secondary school level. Under her leadership, the upper two years were raised to the level of college work. The upper two years of the secondary school curriculum were retained in the Preparatory School. This change made Monticello a junior college; the name was changed to Monticello College and her title changed to President. The standards of Monticello were raised, and instruction was improved to the level that the North Central Association accredited the college as a junior college in 1917. Through the efforts of Miss Erickson, Monticello was honored at the Panama-Pacific Exposition of 1915 in San Francisco with a bronze commemorative medal "in token of her position in the educational world;" June 23 of that year was Monticello Day at the Exposition. Smith College was the only other college given space at the Exposition. She traveled extensively in the interests of Monticello and fostered a high degree of loyal alumni support for the college. During her tenure, a classroom building, a swimming pool and exercise deck were constructed, and a health center and music building planned, which were built later. Miss Erickson was regarded by all who were associated with Monticello as the one who built the foundation of the college, which endures to this day. She was given the title of President Emeritus and served on the Board of Trustees for many years. The lighting was a gift of the alumnae through the Parsons Memorial Fund. As a teacher, Miss Erickson inspired in her students love of learning and devotion to high ideals. As Dean of Women, she was devoted to the welfare of the girls of Indiana State Normal School and set for them the highest example of dignity, charm and the "social graces". As President of the Monticello, she demonstrated her ability as an administrator and leader. She had a dynamic personality, was a beautiful woman with high intelligence, and displayed strength of character and devotion to her profession. Throughout her professional career, she exemplified the virtues of a great teacher and educator. Martina Erickson returned to Terre Haute, and Indian State Normal School as the wife of President William Wood parsons in 1917. As the wife of the President, she was much interested in the students of Indiana State Normal. She was a leader in social-civic affairs in the community, a charter and life member of the Woman's Department Club, and a founder of the South Side Book Club, which was active for many years. She was a member of the Alpha Phi Sorority and an active member of the Faculty Wives Club. After the retirement of President Parsons in 1921 and his death in 1925, Mrs. Parsons continued her interest in and support of Indiana State until her death in 1959. In her will, she left a generous bequest to the College to be added to the Parsons-Sandison Living Memorial Fund. As Dean of Women, wife of the President and as loyal friend and supporter, Mrs. Parsons had an intimate, personal relationship with Indiana State for nearly 50 years. The program for women, which she initiated in 1905, was the foundation of our present program in student personnel services. It has been continued by those who followed her in the position with the same high standards of devotion to the welfare of the students, which exemplified her work in the beginning. Her personal influence on the students and her professional colleagues has bee attested by all who were associated with her. In La Crosse, Wisconsin, the home of the Erickson family, the medical library of the La Crosse Lutheran Hospital will be furnished and dedicated to the memory of Mrs. Parsons through a generous gift of her sister, Mrs. Jeneva A. Lyon of Kenilworth, Illinois. We are happy to have Mrs. Lyons with us today, and I with to present her to you at this time. An institution lives in the hearts and minds of those who it serves. Whatever virtue and excellence, it has attained, are the products of the loyalty and devotion to its purposes of those who build it. It is fitting and proper that their services be commemorated in a tangible form to remind the generations of students and alumni of Indian State that the opportunities which they enjoy and the traditions which they revere have deep roots in the past; that the seeds were planted and nourished by those who long ago preceded them. It is my privilege and honor to dedicate this beautiful residence hall to the service of the women students of Indiana State College. It shall be named Erickson Hall in memory of Martina C. Erickson who served as the first Dean of Women from 1905 to 1910. In this hall, may there be perpetuated the ideals of service to the welfare of the women students which she so firmly established. It will be a lasting tribute to her vision and purpose and her deep devotion to the highest standards of character and learning. 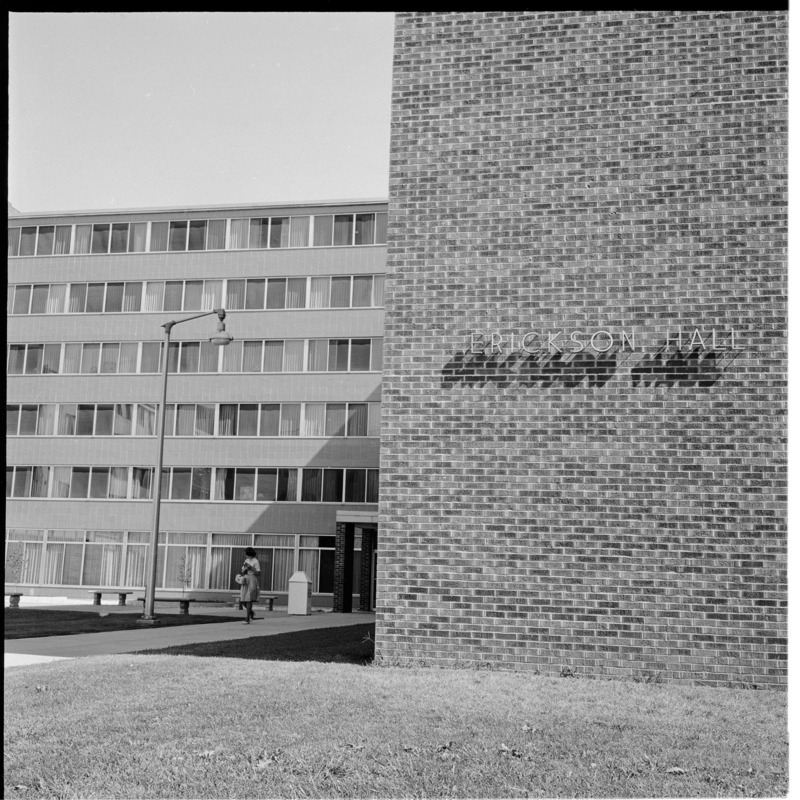 “Erickson Hall,” Cunningham Memorial Library Digital Exhibits, accessed April 21, 2019, http://stateit.indstate.edu/document/146.